NGOs who came and spoke about their work, including Legal Aid SA, who gave out T-shirts and water bottles, the S A History Archive, the Advisory and Information Centre Law Clinic, and the Teddy Bear Clinic who provided teddy bears. Third and final year law students from UNISA, WITS, UJ and one of our previous interns who were our volunteers on the day. Over 15 lawyers who volunteered their time to hold individual consultations with women who needed legal advice. Mjele Msimang who volunteered to take the photos. Our guest was Lauren Salt, senior associate in Baker McKenzie’s Employment and Compensation Group in Johannesburg. Lauren represents both local and international clients in various industries including financial services, consulting, aviation, media, maufacturing and mining. To mark Women’s Month Lauren will address gender pay disparities and the rights provided by legislation, both here and internationally. 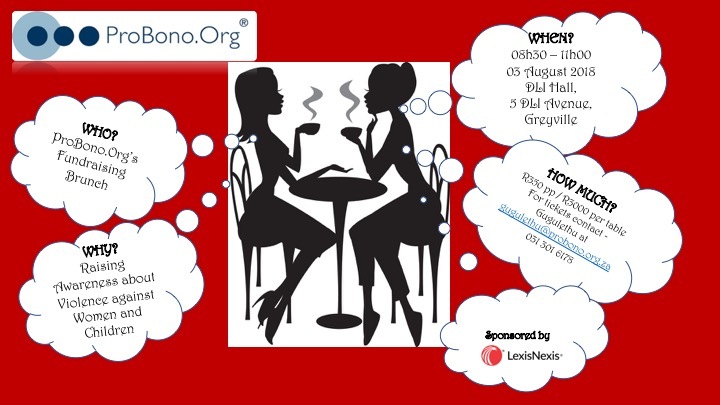 Join Patrick Bracher for ProBono Law on alternate Thursdays at 18h30 (GMT+2), proudly brought to you by ProBono.Org and Norton Rose Fulbright South Africa. ProBono.Org actively increasing access to justice! Radio Today (@Radio2Day) broadcasts on 1485 MW (AM) in Johannesburg and countrywide on #DStv Audio Channel 869. Radio Today also streams globally on: www.1485.org.za and 1485.mobi. Radio Today! Radio that delivers! Our guest was Peter Delius, Associate Professor and historian at Wits, and writer of The Land Belongs to Us, who will talk about land rights and the land restitution process. In 2015 the Constitutional Court declared the Restitution of Land Rights Act invalid and stipulated that land claims lodged by 1998 had to be finalised before the act was re-enacted. In an article published in April, Prof Delius argues that the land claims process may never be finalised (see attached). 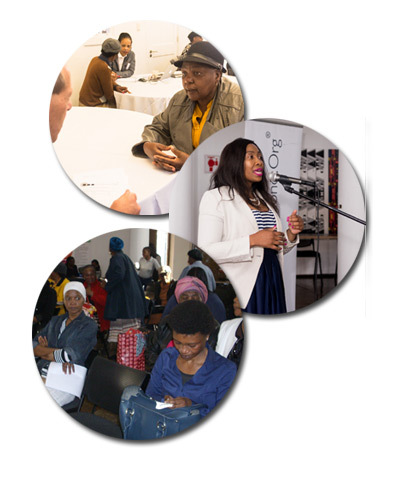 The Durban office of ProBono.Org hosted its third annual Appreciation Day on 20 April at Howard College, University of KwaZulu-Natal. The occasion is an opportunity for us to thank the attorneys who have given generously of their services on a pro bono basis, as well as expressing our gratitude to some of our partners. Several legal practitioners received certificates for their outstanding pro bono work. Mr Ravin Jankhi, the storyteller MC, got into the spirit of the event and rendered his services on a pro bono basis. The event saw the Judge President of the KZN High Court, Judge Jappie, give a motivational keynote address. The main sponsor for this year’s event was LexisNexis. In short, the answer is “yes”. The reasoning, with reference to case law, follows below. 1. What does the Common Law state? The Common Law position is that children below the age of seven are infans and cannot act. A curator or a guardian has to act on behalf of the child. If children are over the age of seven, but under 18, they must be assisted either by a curator or their guardian. If the guardian is not available, the court must appoint a curator on motion proceedings. 2. Did the case law change this position? In 2003 in the Soller case the court appointed a legal representative for the child, to whom the child gave instructions directly and without assistance of a guardian or curator ad litem. In 2008 the court in the Pillay case remarked that the need for the child’s voice to be heard is perhaps even more acute when it concerns children mature for their age, who should be increasingly taking responsibility for their own actions and beliefs. In 2009 the Legal Aid Board acted for a 12 year old girl. The court ruled that the Board did not need to obtain consent of either the court or the child’s guardian to represent a child. This was confirmed further in 2011 by the Supreme Court of Appeal when the Board acted in the Four Children case, and in 2012 in the Brossy case. 3. What does the legislation require? The Child Justice Act merely requires “a parent/guardian/other suitable person” to assist child offenders who instruct their legal practitioners themselves. The Children’s Act allows representation of a child without a guardian. Some magistrates in the Children’s Courts require an application by the legal practitioner to allow the child to be represented. The Divorce Act allows the court to appoint a legal practitioner to represent a child at the proceedings and may order the parties or any one of them to pay the costs of the representation. Section 28(1)(h) of the Bill of Rights provides that: “Every child has the right to have a legal practitioner assigned to the child by the state at state expense, in civil proceedings affecting the child, if substantial injustice would otherwise occur”. In the Van Niekerk case in 2005 the Centre for Child Law was allowed to apply ex parte for the appointment of a legal representative in terms of s28(1)(h) for two girls, without their guardian’s consent. ProBono.Org agrees with the Centre for Child Law that this section does not preclude registered legal organisations to secure legal representation for children. Section 28(1)(h) does not give the state exclusive rights in this respect. In conclusion, if any person (who qualifies in terms of the means test) approaches ProBono.Org for assistance, we will obtain representation without the guardian’s permission, and if necessary the legal practitioner will obtain the court’s permission to act on behalf of the child, because we interpret the current state of the law as not to limit a child’s right to legal representation. We acknowledge Professor Ann Skelton of the Centre for Child Law, who dealt with this issue during a ProBono.Org breakfast on 18 October 2017, and thank her for the notes she made available for use by ProBono.Org. Full case references are available on request. Durban attorney Delia Jay recently concluded a very interesting family law matter. When the client came to us at the pro bono desk, she had been turned away by everyone and told there was nothing that anyone could do to help her get divorced. She needed to get divorced as she had a new partner with whom she had had a child. The client’s husband was a Nigerian and he left South Africa 15 years ago. Despite client’s efforts, he could not be located. Delia contacted a tracing agent to do a search for the husband, but he could not be found. In the end, Delia had to make an application for substituted service to get an interim order on affidavit stating that she could advertise in Canada, where client had last received a phone call from her husband in 2002. The order was granted and Delia personally raised the money to advertise in the Toronto Star, which was about R10 000 because of the poor exchange rate. ($ 1000 Canadian dollars). Delia advertised and the court finally agreed to set the matter down. There were many delays, largely because dealing with the Durban Regional Magistrate’s Court, trying to get documents issued and a court date granted were very challenging. At times Delia felt like she was on a lone crusade and wanted to give up. It was also time consuming, as being a sole practitioner she had to attend to everything herself, including indexing and paginating, and making sure her file didn’t get lost. The magistrate eventually heard the matter on 10 April 2018 and granted the divorce. Delia feels a great deal of satisfaction in having finally achieved a happy result for the client so that she can move on with her life and her family. Chrysi Kripotos is an attorney practising in her own firm in Johannesburg. She is a conveyancer who has been in practice for 34 years. 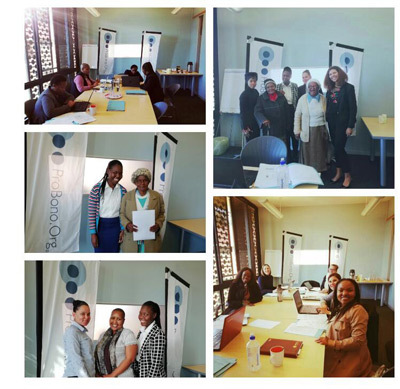 The ProBono.Org Deeds Office help desk opened its doors at the Deeds Office in Johannesburg in June 2017. Chrysi has been part of the help desk since then. Chrysi says that she loves helping people who cannot afford legal services and that attending the help desk is the highlight of her week. Chrysi has assisted clients with property transfers, donations, correction of names in the title deed, transfers from deceased estates, drafting of wills as well as section 17, 45 and 93 registrations. Chrysi gets really frustrated when she is unable to assist clients. She feels that the help desk needs more qualified attorneys to assist with clients’ problems due to the number of people seeking help and that more days should be allocated in order to assist the indigent. Some of the challenges include consulting with clients who coerce their elderly parents to make transfers in their favour. The consulting attorney has to ask the relevant questions in order to determine whether the transfer is in good faith and that the elderly parents are aware of the legal implications. Another challenge often encountered is the transfer of property from household permits to a title deed in terms of the Conversion of Certain Rights into Leasehold or Ownership Act. This has resulted in many clients seeking legal assistance at the help desk in order to reverse property transfers. Many of these transfers have divided families and it is unfortunate that many people still do not know about an Act that affects their lives so profoundly. We welcomed Portia to the team in May and she is working with the Housing, Refugee and Community Advice Office unit. She has an LLB from UNISA and is working towards an LLM in Property Law with the same university. She began her journey with ProBono.Org as a volunteer. Her reason for studying law was to give her the opportunity to help people. Working at ProBono.Org as a legal intern extends the reach of her charitable nature and enables her to assist the vulnerable and indigent members of our society. Outside of work she is a member of the Catholic Women’s League and engages in their social welfare activities such as child adoption. 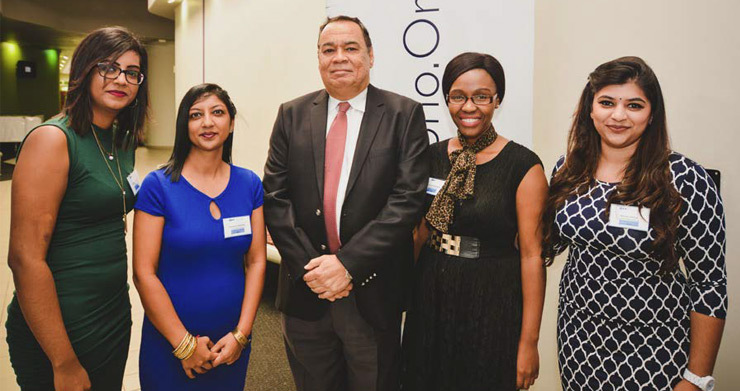 Portia hopes that her continued passion for assisting the marginalised and vulnerable in society helps her to make a meaningful contribution to the legal fraternity. Our guest was Nicole Loser, attorney in the Pollution & Climate Change Programme at the Centre for Environmental Rights in Cape Town.